Considering I get so much done, I feel like I am the world’s busiest procrastinator. I try to not live that “busy” life—the one where, when someone asks how you’re doing, you say “Oh, I’ve been so busy…” It seems like the key to this type of conversation is just semantics. Don’t say you’re busy, even if you are really, really busy. I do feel that I am constantly on the go, though, with a multiple page to-do list for my library, business, writing, and home. Just writing down those four parts of my life gives me the anxiety that would send most people to their beds, pulling the sheets over their head. Hmm…that actually sounds nice. When can I do that? Let’s face it—Life is busy. We all have things we absolutely have to do. What is important is that we take the time to get something done for ourselves. For me, that is writing. For too long, my writing has been an afterthought. It’s been one of those things that I put off for a day when I have several hours to just sit, relax and think. Now, I do love sitting, relaxing, and thinking, but with a full time job, a business that wants to be full time, and a house to take care of, those “nothing to do” hours are few and far between. So, I decided I was going to stop my writing procrastination and get to it. 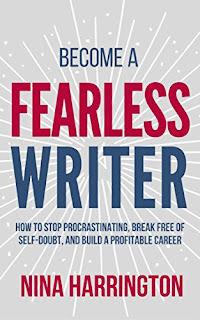 I have a class called Write Fearlessly that I am currently transitioning into an online class, so when the book Become a Fearless Writer: How to StopProcrastinating, Break Free of Self-Doubt, and Build a Profitable Career by Nina Harrington, I had to check it out. 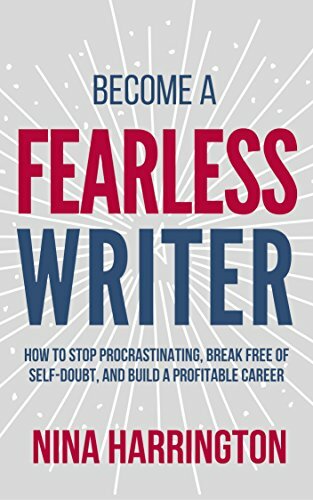 After all, I’ve been procrastinating and I want to encourage others to become fearless, so… makes sense, right? It’s an eBook, so I’m about 18% into it. Everything is jiving with what I’ve been thinking or doing right now, and I hope that I do gain some new insight, not just for me, but something I can share with others. The sad thing is, as I read the book, I feel like I am procrastinating from getting other projects done. When did I become the librarian and writer who thought it was procrastination to sit down and read a book? That mindset has to go! As of right now, I’ve actually written in some time on my to-do list to get writing done. I’ve written this post, so it looks as if it is working already. I’ll update my thoughts on this when I finish the book. No procrastinating on that!